Time: 3 to 5 hours depending on how much time you spend admiring the many vistas along the way and how long it takes you to machete your way through the brush. Short, but steep ascent of rugged rocky mountain face on north shore of Gong beach. Machete your own trail towards the highest peak to your north as you slowly ascend a gradual incline. From Ross, make a right onto island main road headed towards Basseterre. At first roundabout take 1st exit towards bypass. Follow bypass to airport roundabout. At airport roundabout take 2nd exit towards Bird Rock/Frigate Bay. At next roundabout (the newly constructed one in Bird Rock) take 1st exit towards Frigate Bay. Proceed on the current road. At next roundabout (i.e. the Canada Roundabout) take 2nd exit towards Frigate Bay. Proceed 500 feet. At roundabout take 1st exit towards Timothy Fields. After passing Timothy Fields you will enter roundabout, take 2nd exit towards Peninsula. Proceed out onto peninsula passing Shipwreck and continue for another 2 miles or so. On the right you will see signs for Whitehouse Bay/Christophe Harbor. After those signs, the road bears to the left and down a straightaway. At the end of that straightaway, on the left, is a small parking lot about 20 feet max. in from the road. Park here. At the end of the parking lot, directly opposite the entrance you just pulled into is a stone driveway that leads down to the beach. Follow this stone pathway down to the beach. This is where the hike begins. 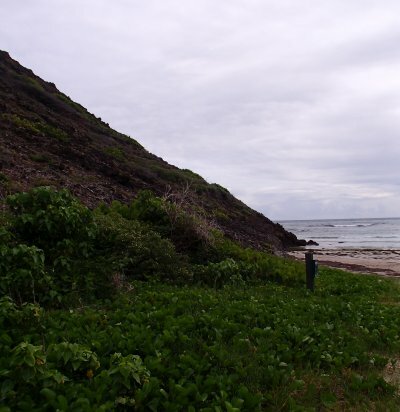 At the end of stone driveway you will emerge on the very northern fringe of Gong Beach. 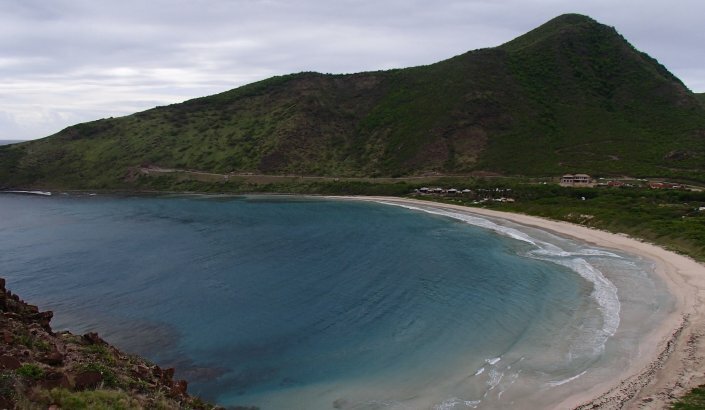 You will notice a steep rugged mountain immediately to the left of the beach. Walk about half way out onto the beach towards the water, turn left and face the mountain. Your goal is to ascend to the summit of this peak. 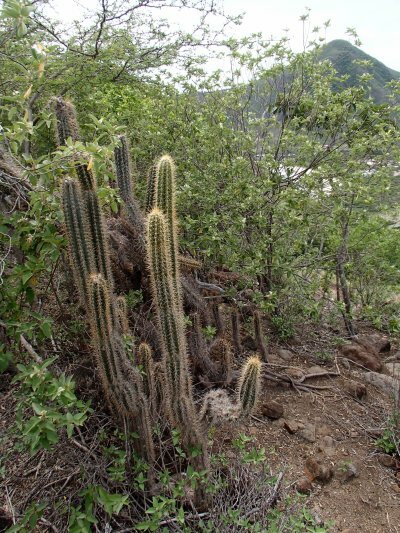 There is no marked trail; however, only scrub brush exists on the mountain so you can easily navigate by landmarks. The easiest route is to literally attack this peak straight on; in other words to literally try to follow a straight line to the summit. The rocks are loose and there are a lot of desert style bushes with thorns and barbs so exercise caution as you hike. Once at the summit, you will realize that this summit you are standing on is in fact not the highest peak in this mountain chain. Look to your left, at about the 10 o’clock position, you will see another mountain peak about ½ mile away from you. The summit of that peak is the ultimate goal. No trail exists between the two peaks so pull out your machete and start hacking away and making your way over there. The area between the two peaks is very dense. A crude machete trail does now exist traversing the valley in front of you but is is very hard to follow. Your best bet is to just take the path of least resistance and chop your way through this area as best you can if you cannot find the machete trail we established. As you ascend the peak, try and stay as far to your left as possible. There is only one vista on the summit and it is on the top of a small cliff located on the very far left of the mountain. The brush in this region is very dense to the point that line of sight is reduced to under 20 feet so if you are too far to the right you will easily walk right on past the viewpoint. You will not be able to navigate this region of the mountain without extensive machete work. A crude machete trail also exists in this region but it is hard to locate when climbing the mountain. Again path of least resistance and lots of chopping away with the machete. Getting up this ridge is going to take you time. It is short in distance but a lot of brush will have to be cleared by you the hiker in order to traverse this ground. Expect to spend 30 minutes easy just trying to get through this one area. This is the termination point for this hike. How Do We Get Back to the Car? 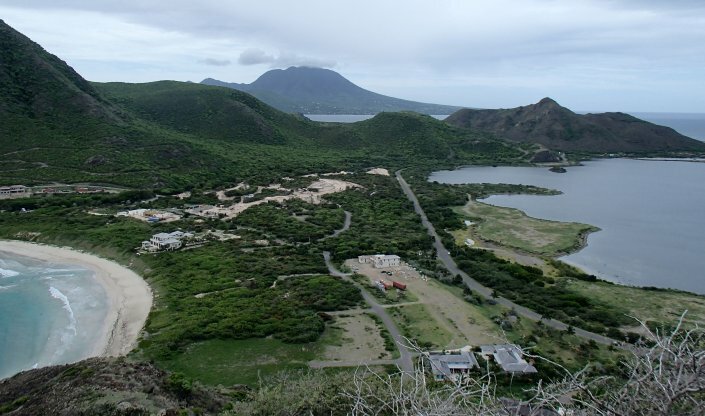 Option One: Directly below you is Whitehouse Bay and Christophe Harbor. You can descend down the face of the mountain aiming for the peninsula road. However, there is no marked trail and the descent is very rugged, steep, and full of loose rock. Although it does not look far, it will take you a good 45 minutes if not longer to reach the road going down this way and you will absolutely need a machete. If you are not an advanced hiker or exceptionally experienced in rock scrambling, I would not suggest taking this route. This route is even steeper and harder than the route that you just took to get to this vista. Once at the road, turn left and walk 15 to 20 min. depending on your pace back to the parking lot. Option Two: Hike out the way you came in. Make your way back over to the summit of the mountain on the northern fringe of Gong Beach and descend down that face to the beach, turn right and walk out to the parking lot. Time to car 45 minutes to 1 hour. 1. This is the area where a dog was lost on a hike last semester and never recovered. Christophe Harbor is very stringent on its No Trespassing Policy and will not let anyone go on their property, including Ross staff, even if it is to do something as innocent as looking for ones lost dog. 2. There is no marked trail so it would be advisable to take a gps. Those familiar with the region can navigate by landmarks but if you are not intimately aware of the layout of the peninsula, it is strongly advised to take a GPS. 3. A machete is an absolute must and make sure it is razor sharp. Also given the extensive amount of time that you will be using your machete on this hike it is also advised to bring a manual sharpener in your bag in case you need to touch up your machete blade. 4. 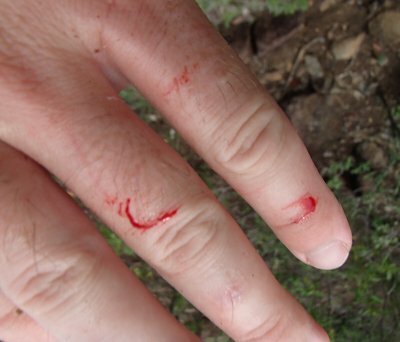 There are lots of cactuses and thorn bushes in the area, some with barbs as long as your finger, act accordingly. 5. There is a shepherd man who roams this area and rumor has it that he is not friendly. If you see him or hear him, steer clear. 6. Leave the dog at home, far too many hazards on this trail that could harm him/her. 7. Pack the sunscreen, this hike is in full sun the entire time. 8. If the weather appears to be turning for the worse, do not attempt this hike. – The rocks are already loose and hard to traverse when dry, when wet, even with the best hiking shoes on, you will be skidding around. – There is no place to take cover from a lightning storm on these mountains. If lightning is forecasted, wait to hike this trail on another day. 9. 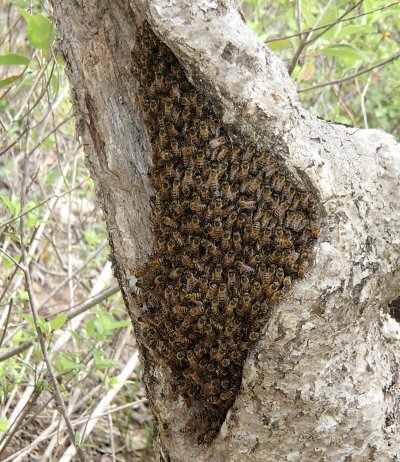 Bees tend to build large nests in the trees in this region and whatever species of bees call this region home do not buzz loud. You can be within 3 feet of a nest of thousands of bees and hear nothing. Watch where you grab and what you chop down.